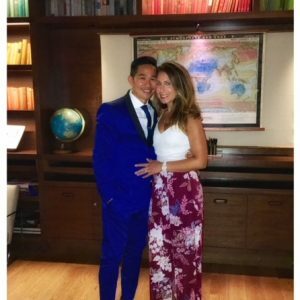 Meet a lovely young couple, Carly and Khoa, who found their perfect, new home in the nick of time! Still enjoying city life in Greenpoint, Brooklyn with their two young children, this duo felt the need to move to the suburbs and be settled in time for school to start! We had four months to find a dream home that was move-in-ready and I was so happy when they said “yes” to their pristine denim blue colonial! Here’s Carly telling their “Sold Story”! Khoa and I met after college. We were both working for a dot-com company and met at a training seminar. It started out as friendship and then became something more! That dot-com company soon went under and I went to work in the fashion industry in NYC, while Khoa, who had been based in Washington, D.C., took a job opportunity that allowed him to move to NYC so we could be closer! We married in 2007 and experienced urban living in Manhattan while we didn’t have kids. Once we started our family, we bought a condo in Greenpoint, Brooklyn. We were looking for a suburban upbringing for the kids. Since I had grown up in Edison, we began looking at areas nearby that had developed downtowns. We checked out Montclair, Maplewood and Westfield. Although I had known of Cranford, it was actually my close childhood friend, Lauren, who convinced me to start looking in Cranford. She told me that everyone loved living there! Once we explored Cranford we immediately fell in love – we liked the small town feel and the tree-lined streets. It was ideally what we wanted! We had to start the search as soon as possible to get our son in school by the beginning of the school year. My friend from Cranford, Lauren, was the one who told me about Sharon. I believe she referred to her as “The Queen of Cranford” because she knows everyone! Sharon was so easy to work with and not pushy. She was very quick to respond to questions any time of day. We also appreciated that Sharon was readily available to show us a house at a moment’s notice. She even showed us homes on Mothers’ Day & we eventually found the house that would become ours on Fathers’ Day weekend!! Sharon immediately told us about our home as soon as she knew it was going to be listed. 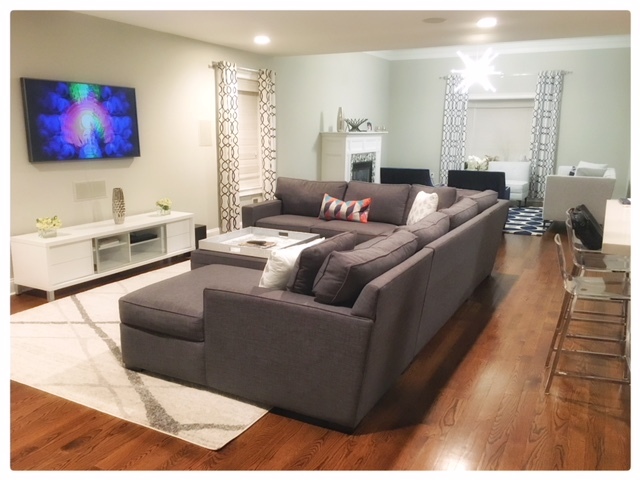 I absolutely fell in love with it in the listing and I told Khoa, “If we go see this house we are going to want it!” We were looking for a new, modern home. The house that Sharon showed us had it all. We loved the big yard for the kids. We also fell in love with the wrap-around porch and the open concept first floor. 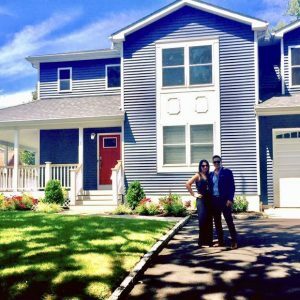 What caused anxiety/stress during the home buying process? The entire process of buying our first home was very smooth. There was only the internal stress of time because our son needed to start the school year in Cranford. Somehow it all came together in the end – selling our condo and moving to our home. We ended up arriving in Cranford about two weeks before school started! Now that you’ve been living in the home for a while, what’s your favorite feature? Everything is very open on the first floor – the living room, family room, and kitchen – it’s perfect for entertaining! 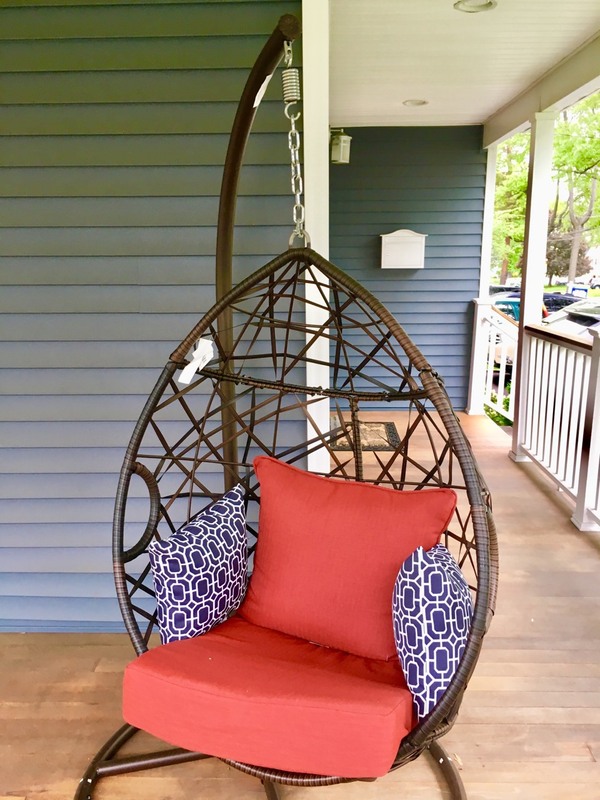 And we love all of our outdoor space, including my favorite “egg chair” on the front porch! What is your favorite aspect of living in Cranford? Now that we have been in Cranford for almost a year – we love the people. I think everyone says that! It’s such a warm and inviting town and our family loves the “hometown” feel. Coming from the city we really wanted something quaint. I would advise a new home buyer not to “jump the gun”. Don’t settle for something just to get into a home. We were so close to choosing a few houses just to move in and be ready for school – but thank goodness we waited till the right one came around! I would tell people to purchase a home when it just feels like it’s the one that is meant to be!